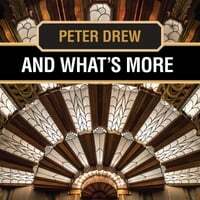 Original songs and arrangements of classic jazz and big band standards by Peter Drew, performed by top New York musicians under the direction of bandleader Ryan Keberle. After the release of Where & When in 2016, I decided to rest on my laurels and give myself a break. My creative juices dictated otherwise. I had more than 100 arrangements on paper, plus a few original compositions bouncing in my head. My mentor, Philip Rothman, reminded me that I had lots of time to produce a second album. So, after two years, here we are with: And What’s More. A hint of an extension of the previous opus. I was fortunate that many of the musicians that had performed for me on the previous outing returned for this collaboration. They are all accomplished in their own right. My heartfelt thanks to the artistry and musicianship of conductor and music director Ryan Keberle, and to all the instrumentalists and vocalists under his baton. To Chris Allen and Owen Mulholland of Sear Sound, and to Brian Montgomery, an amazing sound engineer (who also worked magic on the first album) — thank you. To my friend and graphic artist Robbii Wessen — thanks for being there twice. Again, thanks to Philip Rothman. The “brain trust” behind this collaboration. It would never have happened without him. I again dedicate this to my loving wife, Deanna, who loves my music and is an inspiration to me.